Usually this far into the summer, I’m getting tired of tomatoes. Last year, we were eating tomatoes by mid-June. This year, the long cool spring has really set back the tomato crop. But one of our new tomatoes, the Legend, is finally producing. The Legend was developed at Oregon State University by James Baggett. 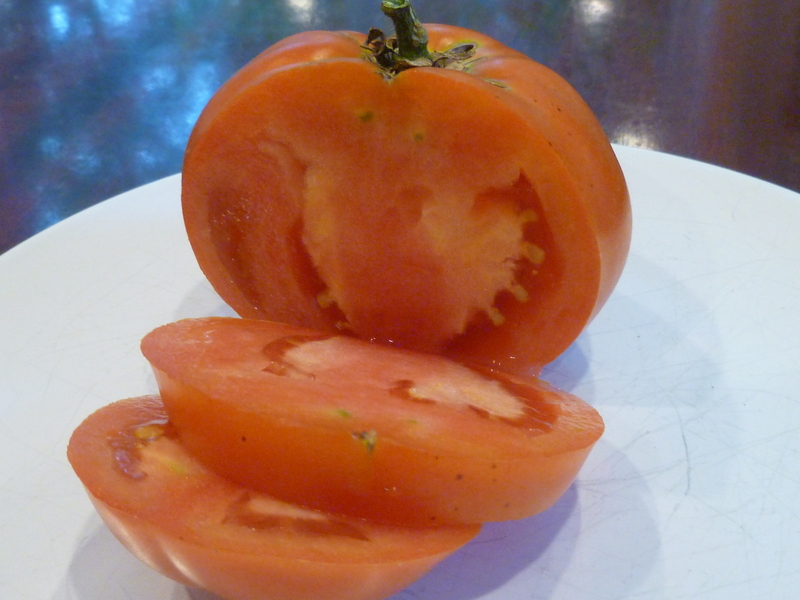 As promised by OSU, it is the first of our large tomato varieties to ripen. This particular plant is one of the ‘grafted’ tomatoes that we bought this year. It’s full of fruit, doing much better than some of the other tomato plants that have struggled with recent monsoon-like rains and now a 6-day heat wave. Baggett developed 45 varieties of vegetables during his long career at OSU, and was named to the Seedsmen Hall of Fame. No, I didn’t make that up. The Seedsmen Hall of Fame, sponsored by Victory Seeds, is dedicated to the horticulturalists who create the thousands of varieties of fruits and veggies that fill the seed catalogs – and entice you in the winter to over-order. “Preserving the past, one seed at a time,” is its slogan. If you’re interested in history, click on some of the biographies of the Hall of Famers. It’s a Who’s Who of those seed catalogs. W. Atlee Burpee, who pioneered the mail order seed business. George W. Park, whose company became an empire but eventually fell into bankruptcy. Henry Field, who made his fortune by undercutting Burpee’s prices. Fascinating reading if you’re a gardener. Back to the Legend. I can tell you that Baggett developed a tasty tomato. I ate the first one with just a drizzle of olive oil and a sprinkle of salt and pepper. It was excellent.